Is it really just a haircut? Do I go short or do I keep it long – hairstyle 2011? ﻿My husband has known me only with long, straight, dark brown/black hair style. Once in a while I change my hair style: Cut with layers, side-swept bangs, parted on the right, the left or the middle – but always shoulder length, if not longer. Whenever I can, I tie my hair in a pony tail (which my husband dislikes), and once in a while in pig tails. I know that my head is a lot bigger and my face a lot wider, but a short hair cut is appealing – less time to dry and style. The last time I had my hair really short was 27 years ago when I was 20 years old and 15 pounds lighter. When I was 40, I had it really long. This is my beloved; This is my friend. But it’s just hair, right? “A wig? You gotta be kidding! Me? Big head. Big, round face. 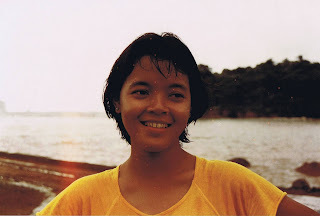 So earlier this morning, I spent the first few hours of the morning checking out pictures from the past of me having short hair and compared to them when I had longer hair…. And now I’m having second thoughts. “Oh boy! You must be going through some major hormonal changes! But if you really want to – just bring a few pictures next week when you come. an inch every month, if we’re lucky…So think it hard and decide before I snap it all off! Isn’t it interesting that as you get older, trivial decision like a hair cut isn’t that trivial anymore? Cut your hair! It IS just hair and I am sure that you will look great!!!!! DO IT!!!!!!!! Keep your beautiful hair and buy a short, sassy great wig for the days you want a change. When I was your age, I had some great wigs for those days when I wanted a change. Short hair isn't easier and on really bad days, you can't put it up - There is no up with short! If you cut your hair, you will start to notice all the women with long, straight hair (which is really in now), and wonder why you didn't keep yours. Also, you look younger and sexier with that great hair that you have. Just look at the pictures with an open mind, and you will see that long is a better look for you. Ugh, winter!! It does nutty things to our head - eat some apple pie and ice cream instead! The nice thing about hair is that it will grow back. Donate your cut hair to the charity that collects it - that will make you feel good! My opinion: I think you would look adorable with short hair. Felicia, when and if I cut my hair, I will definitely donate it. Thanks for reminding me about that! And thank you...Let's see what happens. I'm in the same boat as you. My hair is long and straight. It goes past my shoulders and I'm itching to do something daring with it. I'm thinking short hair would be a nice change. I'm not sure if I'm daring enough and I'm pretty sure my husband likes it long:) He has never known me with short hair and the one time I cut it to my shoulders he thought it was short. BUT, he is not the one dealing with it. Good luck and can't wait to see a picture with your new hair style. No matter what you do, I'm sure you will still look fabulous! I was going to say donate, too if you choose to chop. I'm the reverse... after college, I chopped my hair and pretty much kept it short except when I got engaged. I grew it out for the wedding, but 3 days after the wedding, I got it cut so short, my husband was in a bit of a shock. It is only recently, as I'm getting older than I've been keeping it long. Go for it Jen... it will grow back and I'll bet you'll look even younger than you do now! @sosopie, I couldn't do it. I experimented on how it would look like and it wasn't pretty so I am keeping it kinda long - while I still can. funny I should stumble across this now. I've had long hair for about 7 years now. (I'm 23 now) And as much as I love it I'm also thinking about cutting it. Into the short pixie cut as well. when I told my mum how short I was cutting it, she said I shouldn't do it because basically by doing that I was telling everyone to f- off!! And that if I'm looking for a man that they would go for women with longer hair over those with short. Well geez mom thanks for that lift. I've noticed you decided not to cut it for now, now I'm wondering the same thing! What do you think? You're young! It all depends on what you feel comfortable. I was almost getting my hair cut but then I decided it's better shoulder-length. I even cut my bangs - and I wished I kept it longer.. Do what you feel comfortable doing ..but if you cut your hair, donate it!